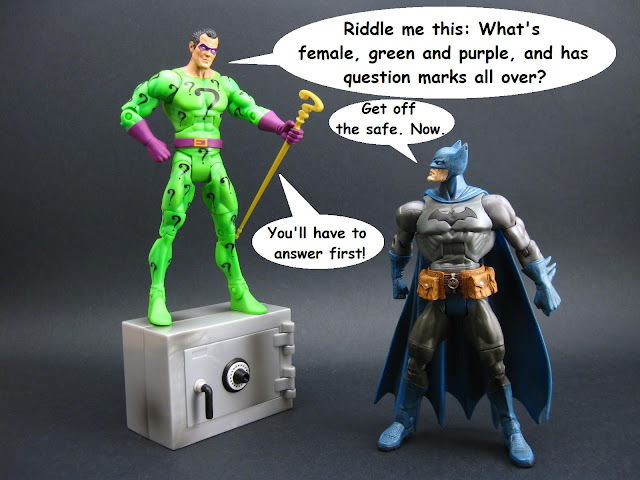 A Major Shift: Riddle me This, Batman! I'm typically not a good riddle guesser. But I want to present a riddle. It had me entertained this morning for quite a while. I will give you some clues clues. Let me know if you guessed right. If you want to pretend you're sitting with the Riddler, feel free. Clue #1. This is a religious party. Clue #2. Its name denotes that they are separate from the other parties of their time. Clue #3. This party takes great honor in their strict observance of the religious laws. Clue #4. This party is greatly careful in avoiding contact with things considered sinful. Clue #5. This group believes in the doctrine of immortality and the resurrection of the body. Clue #6. This group also believes in the existence of angels and spirits. Clue #7. This group upholds the belief that there is authority in oral tradition which is equal to the written law. Clue #8. They believe certain observances of ceremony are required. Clue #9. Self-sufficiency is highly encouraged. Clue #10. They believe they are spiritually correct, while others were spiritually incorrect. In essence, they are going to be saved, while others are not. My daughter and I like to play guessing games. Usually after a few rounds we have to give more clues. So here's final clue, just in case you need it. Clue #11. The answer is found in the 1979 edition of the LDS version of the King James Bible. Answer is on page 750 of the Appendix, column 2.